Welcome to Casa Dwyer: Twins? 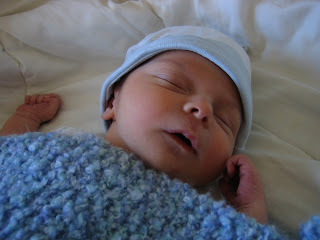 Here's a picture of Sam at 1 week to compare to Will's 1 week picture below. Although (I think) they look very similar at this stage, their personalities are distinct. For example, our first trip out of the house with each baby was the same- a trip to a nearby Target. Sam had his first "melt down" on that trip- crying inconsolably while we practically ran out of the store. Will, however, snoozed through the whole thing. He continued to sleep through lunch when we got home. Here's hoping that Will keeps it up. I think it's going to be tough taking care of these 2 guys, but Will's snoozy behavior makes it quite a bit easier. I'm certifiably crazy about both of them.